Bohinjska Bela lies in the southwest of the Bled corner, in a small valley that was slowly carved by the river Sava Bohinjka. In the south, it is surrounded by the rocky part of the Jelovica plateau with an impressive rock called Babji Zob ("Hag's Tooth"). This cliff was named after the isolated rock that protrudes high above the rapids of the river Sava Bohinjka. In the north, the valley is surrounded by the steep cliffs of southern edges of the Pokljuka plateau. On both banks of the river there are terraces suitable for cultivation and settlements. The village itself lies on the left bank of the river Sava Bohinjka. Its oldest part (dated before the year 1000) is "Spodnja vas" with the church of St. Marjeta, cultural centre, post office, shop, bus station, branch school, kindergarten, fire station and an inn. "Zgornja vas" is a bit younger and is located under the overhanging rock of Iglica, where the largest group of houses and also a boarding house are situated. The newest part of the village is Podklanec which was formed in the vicinity of the train station in the last hundred years. There is also a bus station and an inn with tourist rooms. About one kilometre in the direction towards Bohinj, where the Soteska gorge begins, between the Babji Zob rock and mount Galetovec, there is a hamlet called Obrne. Above the village there is another hamlet called Slamniki, which is divided into the easily accessible part, called Brezje with a few houses, located above the Iglica cliff, and the part with a few scattered mountain farms with a beautiful view of the Bled corner. On the other bank of the river Sava Bohinjka, high on the plateau under Babji Zob, there is the village of Kupljenik with its old pilgrimage church of St. Stephen. 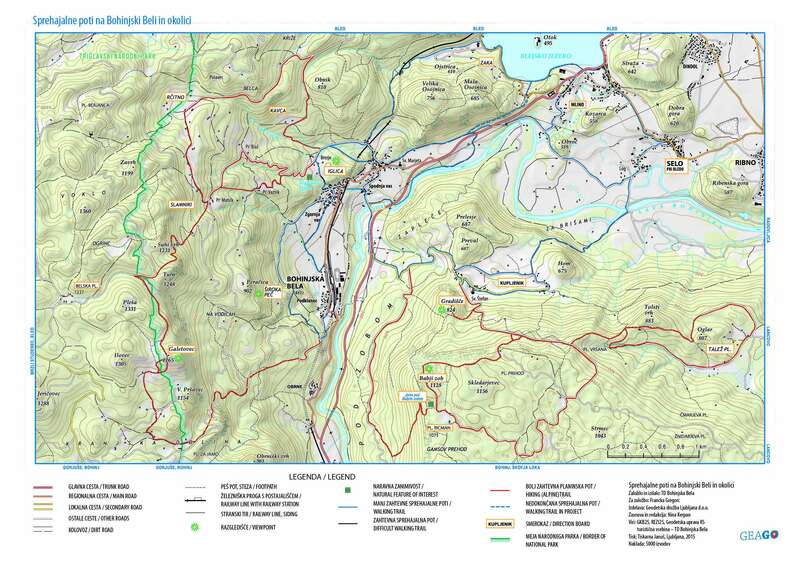 You can now easier explore the area with trekking MAP.